“Greenback” was the nickname for paper money, first issued by the US Federal government in 1862. It was the only legal tender other than coinage. The back of the $1 bill shown below makes it obvious why this bill was called a greenback. The US government took the unprecedented step of issuing paper money to fund rapidly escalating costs of conducting the Civil War without using coinage. “Legal tender” status meant that creditors were required to accept the bills as payment. By 1863, nearly a half billion dollars worth greenbacks were in public circulation. 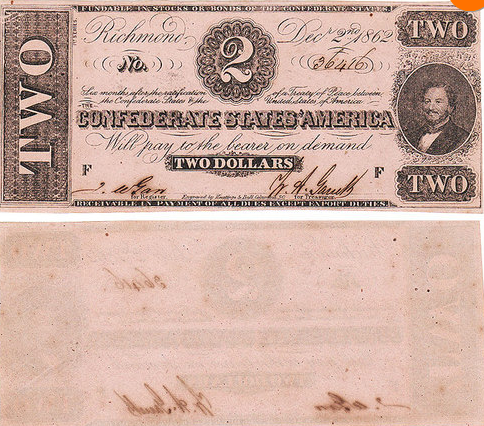 The CSA printed their own paper money beginning in 1861, but with one critical difference: Their bills were not legal tender; instead they were issued with a “promise” to pay after (and only if) the Confederates won victory in the war. Their bills were called “greybacks”, as shown in the photo below, in which only the front of the bill was printed and the back revealed just a faint gray image. The term “greybacks” was also a pejorative, because that is what soldiers called lice (a bane of their existence), and what Union soldiers called Confederates for the color of their uniform as Southerners ran away from Northerners in battle. If war was only between currencies, greenbacks totally annihilated greybacks. Greybacks suffered 9000% inflation during the war, ending up as worthless as the paper on which they were printed. Conversely, Greenbacks experienced only 80% inflation during war, and became the standard for US currency afterwards.